If you’re having a smaller event or would simply like to serve a lighter meal at your event, the trays and dishes offered by Sam’s Italian Deli & Market are a perfect option. 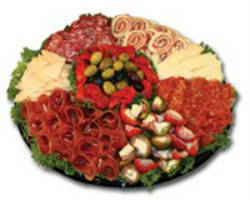 This shop specializes in meat, veggie, fruit, dessert and sandwich platters. 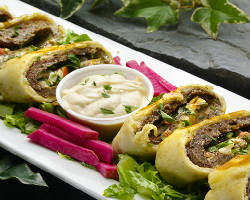 They also offer a full range of salads, breads, entrees, sides and hot hors d’oeurves. These options are always prepared with the highest quality, freshest and often-local ingredients. This shop can prepare a light lunch or a full spread. Famous Dave’s doesn’t just provide your event with delicious food but they will deliver, set up and even serve the food. 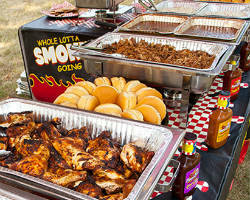 This company specializes in BBQ that can be made to suit your wedding reception or tailgate party. At relatively cheap prices, you can serve your guests mouthwatering dishes. This is a stress-free service, meaning they take care of everything you want them to; to make your big day go as smoothly as possible. Choose this company for fun and friendly service at your wedding, corporate event or business luncheon. 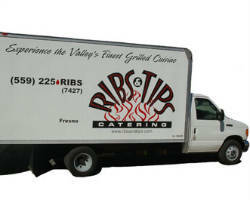 Ribs & Tips Catering is an excellent caterer in Fresno, CA specializing in meats. For meats that have been cooked to perfection and sides that accompany the dishes perfectly, this catering company is the very best. Not only do they serve tasty entrees and sides but they can provide you with sturdy paper plates and disposable dining ware so there is no clean up. This caterer has also laid out some menu options for you to choose from so you only get the dishes and meats you want at your event. 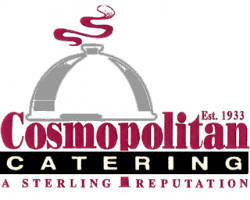 Cosmopolitan Tavern & Italian Grill is not your average Italian Catering company, but rather a company that offers a fusion of Italian food and delicious cuts of meat, all with a California flare. They know that your event is special which is why they do everything they can to make it go smoothly. Regardless of the number of people you will have at your event, this company serves restaurant quality food every time. You can’t beat getting all of this at an affordable price. 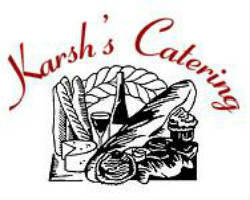 Karsh’s Catering began as a family owned bakery that was a local favorite. From this simple beginning, the family business was passed down and revamped to be a full service catering company. From a small bakery to an award winning catering service, this company has grown beyond serving their loyal customers to being famous as a Fresno catering service. Their popularity has grown because they always use the freshest ingredients to produce high quality dishes and their friendly family-like service. 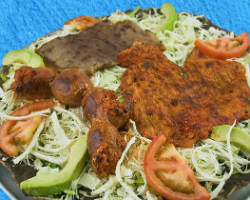 Mexican food is extremely popular throughout the country but especially in California. Since this is a staple in the local culture it is often the favorite of many. If you love authentic Mexican dishes, then why not serve it on the day that is supposed to be all about you. You and your guests will enjoy the flavors from across the border when you book Oaxaca Restaurant to cater your wedding reception. They have served weddings, corporate events, reunions and family gatherings, each time executing the dishes and service flawlessly. The catering service offered by the Phoenician Garden Mediterranean Bar and Grill is a reflection of the service and quality you will get in the restaurant. They do not just serve you tasty dishes, but make your celebration the best it can be. They present you with their most popular and traditional dishes, but are also open to custom options, so if you want mac n cheese or crawfish, they will try to accommodate. The family who owns the restaurant will make you feel completely at ease on your big day. 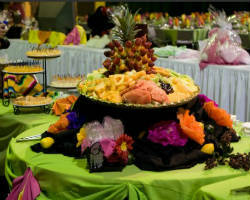 The International Catering & Banquet Conference Center is known for providing full-service, custom catering for each event. They are dedicated to providing the very best quality food for any sized event. They can arrange for you to have a cocktail party, buffet, or seated and served dinner in their conference center. This center seats up to 2,000 people but can be made intimate for smaller groups. With a party venue and event planners as well as catering in one place, you will be able to relax knowing this company has everything figured out. 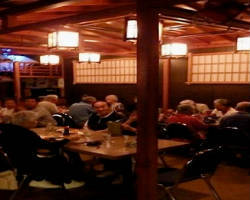 There is something classically chic about serving Japanese inspired food from places like the Tokyo Garden Fresno. This local caterer offers options for you to choose from for each course meaning you will be able to choose your favorites as well as classic options that everyone will love. Whether you are having your event at their restaurant or having it off-site, they always prepare meals with the utmost care and attention. The top quality service is only matched by their menu options.